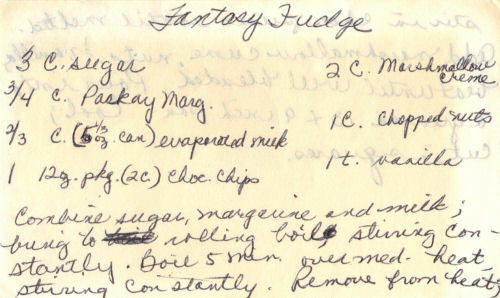 This recipe was written on a slip of paper and found in a large collection, date unknown. I’ve typed it below along with a scanned copy. Combine sugar, margarine and milk; bring to rolling boil, stirring constantly. Boil 5 min. over med. heat, stirring constantly. Remove from heat; stir in choc. pieces until melted. Add marshmallow creme, nuts, & vanilla; beat until well blended. Pour into a greased 13×9 inch pan. Cool; cut in squares.